You are here: Home » #Emilymatters » Courage Calls! women and young people to use their voice and be heard. Bringing people together, to celebrate how far we have come and to empower a new generation to use their voice and be heard is central to the #Emilymatters initiative. We take inspiration from the legacy of suffragette Emily Wilding Davison, as well as the stories of Ordinary, Brave and Extraordinary women, past and the present. The calls for a People’s Vote on the final Brexit deal, with the option to Remain and Reform grow louder by the day. Parliament continues to be in stalemate and unable to back any option. Given that so much has changed since 2016, no one can now claim to speak for the ‘Will of the People’ today, so why not ask the people? More politicians need to have the courage of their convictions and put this momentous decision back to the electorate. If you are also concerned by what is happening with regards to Brexit, please do write/email/speak with your MP. There’s a helpful template that you can personalise on the #notbuyingit website. Throughout the 2016 EU Referendum campaign and subsequent Brexit negotiations, women’s voices have been sidelined, whilst around 1.4 million young people have become eligible to vote. “To the men and women of the Generations which will come after us. – Mary Leigh, from To Freedom’s Cause, (original source: LSE Women’s Library archives). Like its forebear, the Votes For Women campaign, the People’s Vote campaign is a movement, across the political spectrum, for the greater good. A battle for hearts and minds. Despite all the setbacks and broken promises by Westminster, women like Mary, Emily and Sophia Duleep Singh never gave up hope. And nor should we. 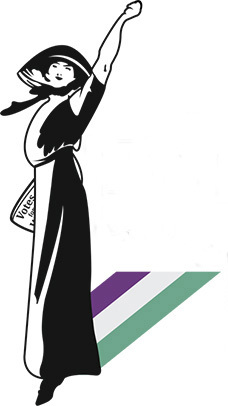 – Emily Davison, call to action speech from To Freedom’s Cause (by Kate Willoughby, 2015). Having written and performed a call to action speech by Emily Davison, drawn from her writings, at several of this year’s Centenary suffrage events this year, I could no longer step up and say those words yet stay silent on such a significant democratic issue that I believe she would be campaigning for today. For me, it is a matter of the heart and head. Having a final say is all about the right to be heard – to check with the electorate, once a deal is on the table, whether we still want to leave. A referendum on the Brexit deal is about listening to and respecting the Will of the People. Silencing people on Brexit would, I believe, undermine the warm words spoken by politicians about the anniversary of the Representation of the People Act. The title of my suffragette Emily Davison ‘Courage Calls for a People’s Vote!’ speech was inspired by the slogan held aloft by the new Millicent Fawcett statue, by artist Gillian Wearing, in Parliament Square. Those powerful words were written by Fawcett about Emily Davison. – Emily Davison, from ‘Courage Calls for a People’s Vote!’ A speech for today (by Kate Willoughby, 2018). The 2018 version of To Freedom’s Cause, my play about Emily Davison and her brave Band of Sister Suffragettes, reflects on the past and looks to future generations, drawing on Emily’s and Mary Leigh’s writings. This new version of the play was performed at the former suffragette (WSPU) Head Quarters last month, as part of the #Emilymatters (#EmPawa) celebrations in honour of Emily Davison’s birthday and Day of the Girl. This Vote 100 anniversary year has seen an inspiring and eclectic range of celebrations, in recognition of the 1918 Representation of the People Act. It has been fantastic to be part of a number of Centenary Suffrage events. There is much to celebrate and it’s absolutely right that we mark this important chapter in the UK’s suffrage history. What would Emily and her suffrage sisters do? What would Emily Davison, Mary Leigh and other women’s suffrage campaigners make of what is happening in the UK today? I am sure that they would be very moved by this year’s impressive array of community events, initiatives and statues; pleased to see that their incredible work has not been forgotten, but also mindful that we are in fact in the Vote 90 year (It was 1928 before all women had equal voting rights with men). I also believe they would be deeply concerned by the current state of affairs we find ourselves in. Listening to women and young people is the focus of my work with the #Emilymatters initiative. It has become increasingly clear that their voices are not being heard in Westminster. Surely this is the year to change that and create a living legacy that does women like Emily Davison and her suffrage sisters proud? We stand on the shoulders of giants – Ordinary, Brave and Extraordinary women, who never gave up the fight for equality and the right to vote. Now it is our turn and time is pressing. – Emily Davison, from ‘Courage Calls for a People’s Vote!’ (by Kate Willoughby, 2018). What prompted me to first write To Freedom’s Cause, was the last letter Margaret Davison wrote to her daughter, the day after her Epsom Derby protest. It was heartfelt, urgent and full of love. – Margaret Davison, 5th June 1913. To Freedom’s Cause has always been a very personal piece. A performance of the play in the House of Commons in 2014, directed by Brian Astbury, was the catalyst for #Emilymatters (a cross-party initiative that seeks to build on Emily Davison’s phenomenal legacy and create a living legacy, by encouraging more young women to Step Up, Vote and Lead). House of Commons performance of To Freedom’s Cause, 2014: Emily Davison (Kate Willoughby), Photo credit: Brian Astbury. Every week the calls for a People’s Vote on the final Brexit deal grow stronger, from Nurses, Midwives, Doctors to businesses and lawyers adding their voices, backed up by nationwide surveys, including by Channel Four News. I want to make it very clear that I believe that we all have the right to our minds, or to stay the same when it comes to Brexit. That is what makes us a mature democracy. Given that so much has changed since 2016, no one can claim to speak for the ‘Will of the People’. Don’t let the media or political figures silence you with talk of some people never voting again or defying democracy. It is up to all of us to listen, learn and act on the genuine issues that were highlighted by the 2016 referendum result. A People’s Vote is not about the status quo, it is a moment for politicians to step up and tackle issues that for decades UK governments have looked away, which some elements of the media have sought to blame on the EU. The final say on the Brexit deal is above party politics and it is far too important to be left to assumed consent, when so much has changed and a new generation of voters are eligible to have their say. What we decide will affect their futures far longer than ours. I believe it’s time to listen to and trust the electorate in a free and fair vote on the final Brexit deal. « 11th October Celebrations – Thank you!